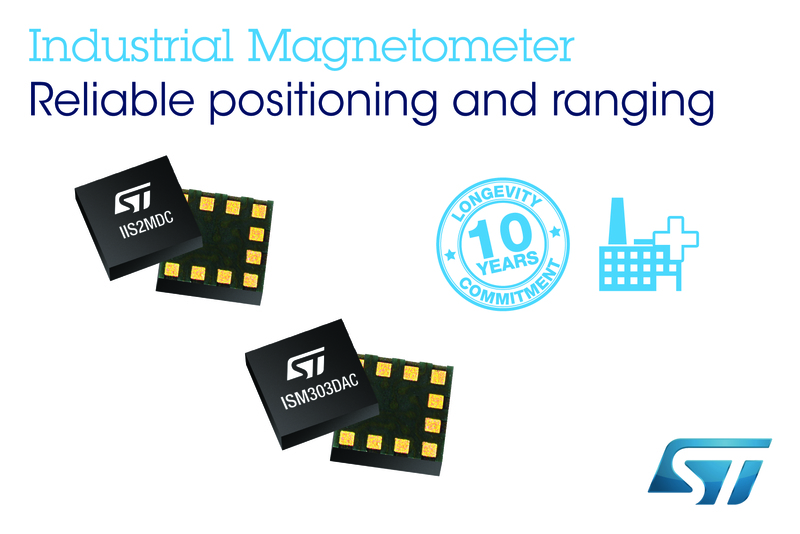 Geneva, July 31, 2018 -- With industrial-grade longevity that assures availability for 10 years, the STMicroelectronics IIS2MDC magnetometer and ISM303DAC eCompass enable both reliable, low-power tamper detection for smart meters and precision motion and distance sensing in applications from industrial automation and robotics to smart buildings, smart security, and medical devices. Both devices can be configured to generate an interrupt signal for magnetic-field detection and automatically compensate for hard-iron offsets provided from the higher application layer. Additionally, the ISM303DAC can also generate interrupts upon recognition of freefall events, tap and double-tap, activity or inactivity, 6D-orientation thresholds, and wake-up events. A built-in FIFO stores accelerometer data to minimize main-processor intervention and, as a result, reduce system power consumption. Development support includes drivers for both sensors, and software examples including tilt-compensated electronic compass, dynamic magnetometer calibration, and 6-axis or 9-axis sensor fusion. The STEVAL-MKI185V1 adapter board for the IIS2MDC and STEVAL-MKI184V1 for the ISM303DAC are also available, ready to plug into a standard DIL24 socket on a motherboard such as the STEVAL-MKI109V3 professional MEMS board to assist development using ST’s Unico GUI. The IIS2MDC and ISM303DAC are available now in the leadless 2mm x 2mm x 0.7mm LGA-12 package, priced from $0.85 for the IIS2MDC or $1.9 for the ISM303DAC. The adapter boards are available directly from ST or from distributors, at the recommended price of $16 for the STEVAL-MKI185V1 or $17.15 for the STEVAL-MKI184V1. The STEVAL-MKI109V3 main board is also available from ST or distributors, priced $85.75. Please visit www.st.com/industrialMEMS for further information.